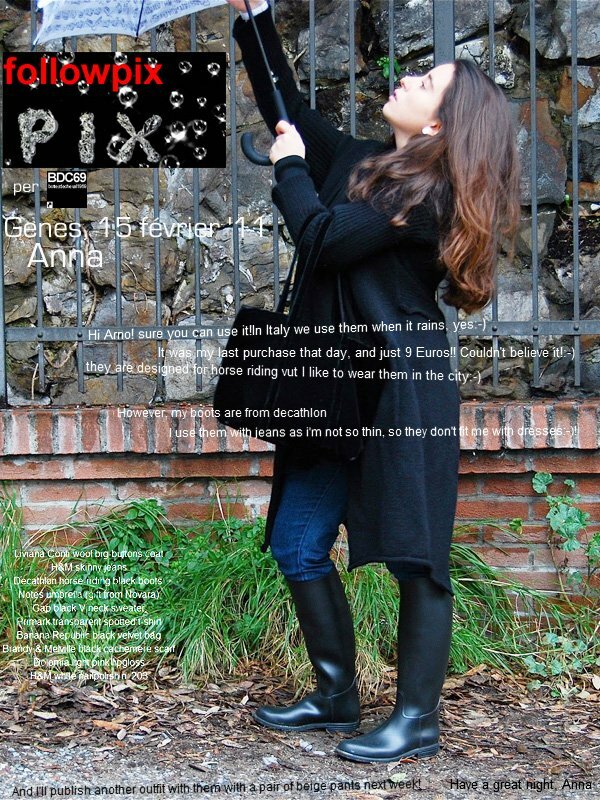 Followpix - fashion blogger genova: Spotted on a Parisian web-site! My exam is finally finished, I think I passed it, but the real result will come in 2 weeks :-s! Ok, I just wanted to thank 10000 times the sweet Arno for picking me as "fille blogger" for an article on his amazing web-site. It'a a parisian site all based on rubber boots :-)! He found my photos wearing a pair of them in this post, and created a combo of photo + my words + his lovely words! It was a real pleasure to be choosen, and soon another outfit with those boots! Il mio esame è finalmente andato, credo di averlo passato, ma il vero risultato arriverà tra 2 settimane :-s! Ok, volevo solo ringraziare 10000 volte il dolce Arno per avermi scelta come "fille blogger" per un articolo sul suo fantastico sito web. E' un sito parigino tutto basato sugli stivali di gomma :-)! Ha trovato delle mie foto in cui ne indossavo un paio in questo post, e ha creato una combinazione di foto + mie parole + sue adorabili parole! E' stato un vero piacere essere scelta, e presto un altro outfit con quegli stivali! Hope you like the link! Spero vi piaccia il link! cosa vedoooo,stivali di gommaa io li ADORO!! Oh Ninja you are twice times sweet!! !for thinking about my exam but also for the award, it really makes me feel special in some way! :-):-) Thanks!! Certo Nesi, grazie:-) Spero di averlo passato!! And greaaaat for your exam! Congratulations! I'm sure you passed it! :') Just let me know! And don't worry if you don't understand french that much, jaja! I should write in english, that's right! intanto in bocca al lupo per i risultati e poi complimenti per l'articolo. La foto è davvero bella! sisi certo H&m è bellissima quella camicetta! Ciao Elisa grazie mille:-) Che occhio che ho!! Thanks chloe, your blog is fantastic!! beata te almeno ti sei tolta un esame! And yes, I hope he does it for love and caring and not for being what he thinks a good father is! I keep my fingers crossed that you passed your exam. Ciao Giulia, purtroppo (se l'ho passato) era solo un parziale per ora! Congrats on being featured on the Parisian website. That picture of you is adorable! FFM, oh, you're so sweet, I really appreciate your interest, you're so kind!! And I wish you a wonderful week too!! Howdy! Тhis is my fіrѕt visit to yоur blog! We are a collectіon of volunteers and starting а neω іnitiative in a community in the ѕame niche. Your blog prοvided uѕ valuablе informаtion to work on. Yοu have done a wοndeгful job! Excellent post. That's exactly what I was looking for.